The item Justice League of America, Volume 2, issue 7-11, Curse of the Kingbutcher, Steve Orlando, writer ; Felipe Watanabe, Jamal Campbell, Andy MacDonald, Neil Edwards, pencillers ; Scott Hanna, Jamal Campbell, Andy MacDonald, Sandu Florea, inkers ; Hi-Fi, Jamal Campbell, colorists ; Clayton Cowles, letterer, (electronic resource) represents a specific, individual, material embodiment of a distinct intellectual or artistic creation found in Kent District Library. DC characters Vixen, Lobo, the Ray, the Atom, Black Canary and Killer Frost are no one's idea of Earth's greatest heroes...and yet they've all been brought together by Batman to form a new incarnation of the Justice League and all that it stands for. This new League was founded on principles of hope, on the idea that everyone deserves a second chance...and yet those same ideals now threaten to tear the team apart. When the team rescues Makson, a strange man from a hidden land of monsters, it seems like he's ready for that exact kind of second chance. But Batman has his doubts. If he's wrong about Makson, does he really believe in the optimistic vision that the team was founded on? And if he's right, does anyone ever deserve the Justice League's trust again? 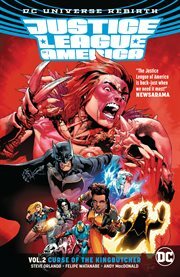 Writer Steve Orlando (MIDNIGHTER AND APOLLO) and artists including Felipe Watanabe (CYBORG) and Andy MacDonald (DETECTIVE COMICS), Jamal Campbell (Mighty Morphin Power Rangers) and Neil Edwards (JUSTICE LEAGUE) test the limits of the strangest team to ever call themselves the Justice League of America!